Julie's Boyz: Getting older is a DRAG! 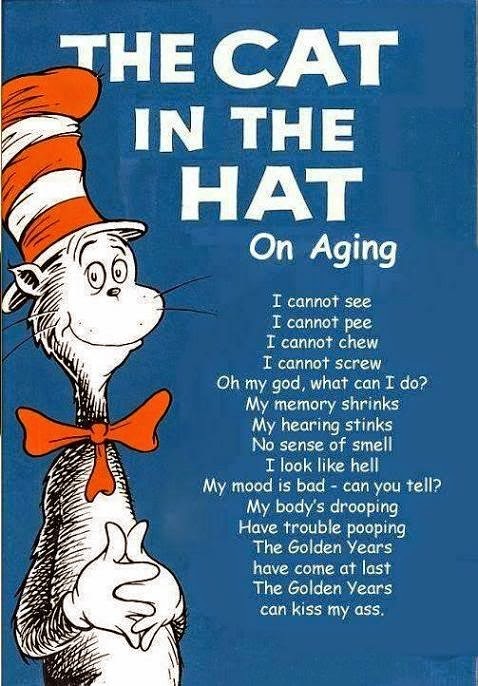 Getting older is a DRAG! Getting older (I refuse to say "old") is a drag. Although it is still better than the alternative, middle age is just weird sometimes. Being the youngest in my family (with a 10 year age span) has allowed me to never feel "old". After all, if my sisters aren't "old", how can I possibly be old? I also refuse to lie about my age. Growing up my mom used to always say she was 27. I was gullible and I believed her until her 40th birthday when some friends put a sign in our front yard. Of course, she was 32 when I was born. For some reason I have been a horrible judge of a person's age my entire life. If I were ever to lie about my age, I think I would do it in reverse. What if I were to tell you that I am 67 years old? Don't I look dynamite for 67?!?! What if I were to tell you I am 27 years old? I don't look so good for 27. Because I'm 47. So I'm not going to lie to make myself sound younger! Hairs grow out of previously hairless follicles. I plucked a doozy this morning from the top of the side of my nose (like a runaway eyebrow hair) except it was super pale and it was OVER an inch long. WTF??? How did I miss that bugger for that long? Right. I can't see anymore. When your hobby involves looking at small details, this is a really annoying part of aging. Hot floods. Nope, I don't get hot flashes, I get hot floods. I am always about 3 degrees hotter than I used to be -- and DH already said I had a 2 degree temperature tolerance so this pretty much puts me always out of my comfort zone. Best of all, my oldest sister had this for about 10 years. I think I'm on year 3. Great. Only seven to go. Everything creaks. When I was little my mom noticed that my one knee ALWAYS popped when I squatted down -- like cracking your knuckles. I haven't noticed my knee in ages because everything makes noises these days. Trying to work out is a regular little symphony. My entire shape has shifted. OK, I have 20 extra pounds I would like to shed. But still. Eleven years ago I needed to lose 40 pounds and I'm pretty sure I didn't sag as bad then as I do now. Sigh. Then of course, actually losing weight or toning up takes more effort for the same (or lesser) results. And naturally I have less energy to do the training. Still life is fun. When I think about the fact that my older brother died when he was 29, I am pretty happy to have made it to the ripe old age of 47. I love my husband, kids and this crazy, mixed up thing we call life. So while I might gripe about some of the less enjoyable aspects of middle age, overall I won't complain too much. Well I might, but most of you probably wouldn't be able to hear me anyway! This is me too, as you know :) Like that, I try to remember all the people I know who didn't get as far as I have, and try not to complain too much! TBT - Do ya feel lucky?